RugbyRecruit.com was launched in 2016 with one simple goal—to help connect high school players with college coaches. The RugbyRecruit founders are youth, high school, and college coaches in Northern California. They recognize that high school players have few resources to help find suitable college rugby programs. They also know that college coaches know next to nothing about high school players, even those who play in their own back yard. RugbyRecruit has designed a system that rates and ranks players to help coaches identify talent and target recruits who meet their program’s academic and athletic requirements. RugbyRecruit also gives players a platform to promote themselves, contact coaches, and find information about college programs. Young rugby players with desires to play at the next level can find it very difficult to navigate the college, club, and academy landscapes in America. RugbyRecruit partners with coaches and recruiters to give recruits access detailed information about rugby programs throughout the country. College, club, and academy coaches don’t have a database of players to recruit from and usually are left to depend on recommendations from a player’s current coach. RugbyRecruit gathers all the information programs are looking for to decide which players they would like to recruit. "I want to thank the RugbyRecruit.com team for giving me a platform to put myself out there and helping me continue my rugby career in college. Without them I wouldn't be able to say that I will be playing rugby for the Saint Marys Gaels in Spring 2018! 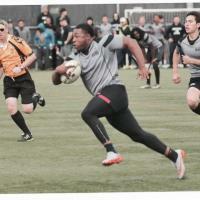 Thank you RugbyRecruit.com for giving young men like me a future in collegiate rugby. "